Karen Lewis and the officers and members of the Chicago Teachers Union announced at a packed press conference on Friday afternoon, June 1, 2012, that the union will conduct its strike authorization referendum during the week of June 4, with full results expected by June 8. Under the terms of the law known as "SB7" (for Senate Bill 7), the union is required to get approval from 75 percent of its members in order to move towards a strike. (Retiree members are not part of the union that participates in strike votes). 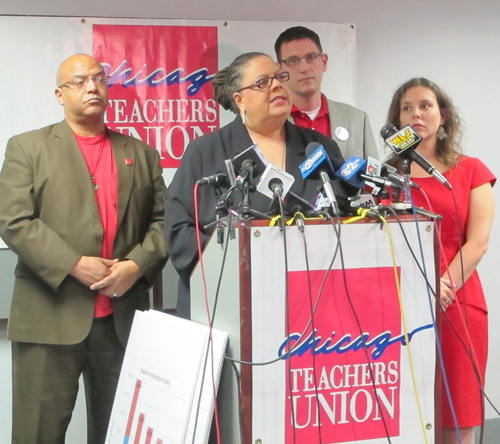 Chicago Teachers Union President Karen Lewis (above at podium) announced the strike authorization voting to begin June 6, while the union's officers looked on. Left to right above: Recording Secretary Michael Brunson, President Karen Lewis, Vice President Jesse Sharkey, and Financial Secretary Kristine Mayle. Substance photo by Sharon Schmidt.The press conference, held by the union at the union's Merchandise Mart headquarters, included the union's officers, rank and file teachers and PSRPs, and parents who are supporting the union's demands for better schools. "CHICAGO – Today, June 1, 2012, the Chicago Teachers Union (CTU) announced it has set a strike authorization vote for Wednesday, June 6th, which will be conducted in all Chicago Public Schools (CPS) with CTU members. State law requires 75 percent of Union members to vote in the affirmative in order to authorize a strike. More than 90 percent of teachers, clinicians and paraprofessionals have already rejected the Board of Education’s current contract proposals. "1. Eliminate any real enforcement of class size limits: In their proposal to the CTU, CPS uses the same argument that Republican presidential candidate Mitt Romney recently made in Philadelphia. The CPS proposal claims, contrary to common sense and teacher experience, that class size does not matter. Their language in quotes says that 'the board shall establish a class size policy and notify the union of that policy.' Not only will they impose whatever class size they think is appropriate, after they have said class size doesn’t matter, they have cut any funding in our contract to lower over-sized classes and have eliminated any real limits on ballooning class sizes next year. Saucedo Elementary School teacher Sarah Chambers is one of dozens of teachers and PSRPs who have been serving on the union's broader bargaining team for more than 18 months. 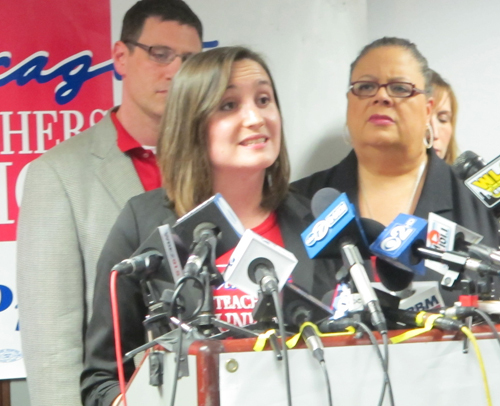 Chambers and others tried to explain to the press how the CPS bargaining group (which does not include Jean-Claude Brizard, who at $250,000 per year is the highest paid official in Chicago history) has been insulting the teachers at virtually every session. Substance photo by Sharon Schmidt."2. Ignore staffing levels in all schools: The Board has rejected all of the CTU's proposals on appropriate staffing levels for our students. Including art, music, physical education, library and world language teachers -- counselors, social workers, nurses and school psychologists -- despite woefully inadequate staffing levels throughout the district and a longer day that will require additional staff if it is to be a better day. 3. Reject ‘better school day’ proposals: CPS refuses to accept any of CTU’s recommendations regarding full day kindergarten, playground facilities and air conditioning for all schools -- despite just last week many of our schools reaching temperatures of over 90 degrees, when learning becomes nearly impossible and classroom conditions inhumane. They have already cut the facilities budget by 85 percent next year even as they propose 60 new non-union charters and plan to close nearly 100 schools next year. 4. Refuse to adequately compensate teachers: CPS continues to disrespect teachers with a 2 percent raise offer for the first year of a five year contract even though working at CPS is getting much harder next year. 5. Refuse to offer job security to qualified teachers: The Board plans to remove protections for experienced and qualified educators who lose their positions through no fault of their own which will exacerbate the current 50 percent teacher turnover rate every five years -- something that interferes with continuity and quality instruction. On behalf of every public school teacher, clinician, and paraprofessional who is a part of the CTU, I can say assuredly, we are tired of being bullied, belittled, and betrayed by this District and the City of Chicago. That is why on Wednesday, June 6th, we will conduct strike authorization votes in all of our schools. Due to the overwhelming support of our members, we expect an affirmative vote well over the 75 percent threshold. State law requires that 75% of our entire membership must vote ‘Yes’ or else we CANNOT strike should we decide to do so at a later date. An overwhelming ‘Yes’ vote will show the mayor and the Board our unity and resolve and will produce movement at the bargaining table. Bargaining is continuing over the summer and we aim to have our contract resolved as school starts next fall — hopefully without a strike. But if our membership rejects their final offer, your strike authorization allows us our option of last resort. Vote ‘Yes’ on the strike authorization June 6th to keep the pressure on! Chicago Teachers Union’s officers will host a live Telephone Town Hall session this Sunday, June 3rd, at 7pm on next week’s CTU Strike Authorization Vote. Although our contract with the Chicago Board of Education expires on June 30, 2012, negotiations for our next collective bargaining agreement have been ongoing for months. This Sunday’s Telephone Town Hall is your opportunity to hear the latest news about the board’s anti-union “turn back the clock” proposals to harm our students, our classrooms, and our careers. You can also ask questions and share ideas. We need your voice, vote, and solidarity at this critical time for our members and our students. ■ A 2 percent raise in year one. ■ A pay freeze in year two. ■ Raises based on “differentiated pay’’ in years three to five. A joint district-union committee, to be seated in January, would decide how “differentiated pay” would work but it could reward teachers of high-need subjects, in high-need schools, or in teacher leadership positions, or those who rate highly in a new teacher evaluation system that is tied, in part, to student growth. ■ Elimination of “step and lane’’ increases for extra years of seniority and added certifications. ■ A longer school day that, under a new law, does not require union approval. The elementary school day will increase from 5 ¾ to 7 hours, and the high school day will increase from 7 hours to 7 ½ hours four days a week, with an early dismissal on the fifth day. I am a union teacher in a neighboring state. I wish our association had the legal means, organization and the guts to do what you are doing. Instead we sit by and let politicians decide what is best for us. Go CTU! Show us how it is done. They Asked for It, They are Gonna Get It! ■ If the parties can’t agree, they must present their sides over 75 days to a neutral fact-finder — a process that’s already begun. The fact-finder’s recommendation is due July 16. If both parties don’t accept it by July 31, a 30-day no-strike window opens. The earliest the CTU could strike is somewhere between Aug. 17 and Aug. 31. Classes for kids in year-round schools start Aug. 13; classes for most kids starts Sept. 4. ■ 75 percent of all CTU members must authorize a strike, up from a simple majority of all who vote on any strike proposal. However, the union’s House of Delegates must then set the strike date if a deal is not reached. Will we have your back tomorrow Wisconsin teachers? I am looking forward to a serious analysis by Substance to the defeat in Wisconsin. That analysis needs to include a look at public sector unions dependence on the Democratic Party I think. 1. Don't get distracted by mainstream political parties and lose sight of own issues. The labor movement was poised for a big win at the height of the protests in Wisconsin, but some timid labor leaders siphoned the energy away into the "recall" election campaigns. 2. Don't ignore politics and the power of state governments, either. The recall election DID accomplish something, by removing enough Republican legislators so that Gov. Walker no longer has a majority to pass his destructive policies. Based on the current vote count the apparent victory for former Sen. John Lehman over Sen. Van Wanggaard would give narrow control of the Wisconsin State Senate to Democrats 17-16. Republicans controlled the Senate 19-14 at the beginning of the last year but lost two of their seats in last summer's recalls over Walker's union legislation. The Wisconsin Legislature is not scheduled to meet this summer. But Democrats' control of the body could be short term because they will have to defend it in just five months under redisricted maps drawn by Republicans. I agree Democrats can for the moment stop bills, but will they? Three of the counties that voted for Barret are in the very far north of Wisconsin. A big part of the opposition to Walker coming from up there is based on the Republican push for massive strip mining in these counties. Air and water quality in northern Wisconsin would be harmed by mining waste dust from tailings, waste rock, ore transportation and ore processing, which produce contaminants such as mercury, arsenic, and other heavy metals, sulfates, sulfur dioxide, and nitrogen oxides. These last two contaminants combine to help form acid rain, while high concentrations of sulfates harm native wild rice. One very bad mining porposal was co-sponsored by Wisconsin Republican Sen. Dale Schultz and Democratic Sen. Bob Jauch it basically failed. There is massive corporate pressure on the Legislature to change the state's mining laws so a new iron mine can open in northern Wisconsin near Lake Superior. It gets even more complex because Wisconsin construction trades workers unions are supporting mining expansion and are pushing more Democrats to support that legislation. Moreover, the Wisconsin Education Association Council (WEAC), which represents most public school teachers, lost one third of its local unions contracts with school districts since Walker took office. In August, WEAC laid off 40% of its staff when the provisions of Walker's legislation kicked in that allowed public employees to opt out of paying union dues and prohibited government employers from collecting those dues for unions. A sober assessment needs to be done.